I’ve been a shopaholic. Not always, I prefer the frugal lifestyle, yet different times in my life I shopped non-stop. If I was meeting friends, we met at the shopping centre. Every week I bought new clothes before I had kids then once I had kids I bought stuff for them. This year, prior to starting my no spend challenge, my vice was food. I started spending more on food, eating out a lot because I thought it was easy and ‘didn’t cost too much”. 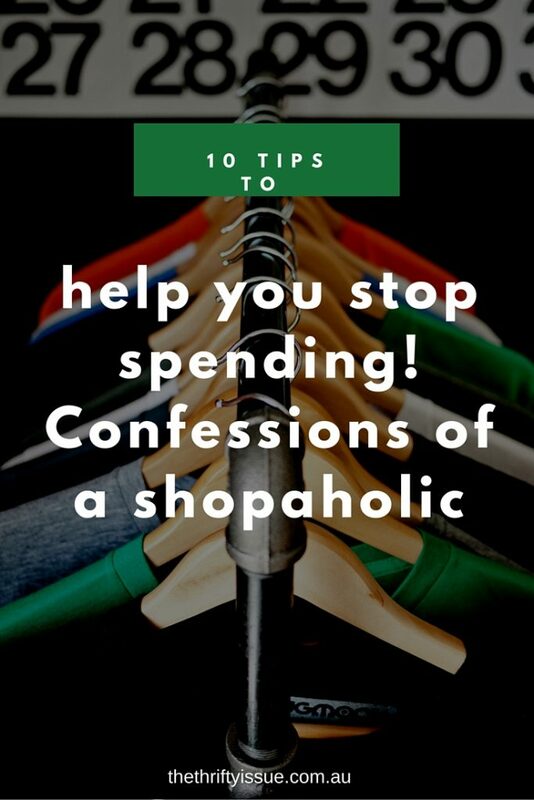 With this in mind, and knowing how and why I have been a shopaholic at times in my life, here are my tips to stop spending. I have been an emotional spender. When I was a teenager/young adult I had depression. A new outfit made me feel better for a bit. It never lasted long and I wanted that feeling as much as I could so every pay day I bought more. Realising the reason behind the desire to spend helps you determine how to end that cycle. As an adult, my spending has gotten out of control when I have felt unattractive or depressed. Knowing this, instead of going shopping I aim to go for a run or catch up with friends at a park or at home. Finding an activity to distract myself and not spend money helped curb my spending. Instead of blowing money every time you get it, select an amount you allow yourself to spend each pay, but don’t go over it. I call this sanity money and it is an amount I can keep to do whatever I want with whether it be buying new shoes or going out with friends. It is no guilt, carefree spending money. It helps limit the risk of overspending in other areas and means I am getting what I want without having to rework the budget, put it on the credit card or jump through any other hoops. When I leave the house I rarely take my purse with me now. Usually it’s my phone, keys and headphones in my pocket, nothing else. This stops impulse buys because I don’t have the money on me to spend. If you know you are likely to spend up a storm online, block the sites for a while. Chrome has an extension you can install called Self Control which allows you to block certain websites for however long you choose. Sometimes limiting your access is what is needed to stop the spending or reduce the urge. How much have you spent unnecessarily in the last week? Month? Year? Add it up, go over your bank statements, look at items around your home and work out how much you have spent on stuff. We did this recently and it made us feel sick. Our spending wasn’t in ‘stuff’, it was mostly take away food because we were tired and lazy. Now you see all the things you have bought and how much it cost you, sell off anything you aren’t using. You’ll quickly see you don’t get back anywhere near what you spent on the items and it is a lot of wasted time and money having bought these items. How much do you make per hour? How many hours did you have to work to pay for these items? That calculation alone often makes people feel uncomfortable. Take it further. How much time did you spend shopping for and purchasing this item, how much time was spent moving it around your home, dusting it or cleaning it when you weren’t really using it? How much time has it taken you to de-clutter and either sell or get rid of it from your home? Add those hours to the amount of hours spent obtaining the item. How much of your time and money was spent on this item? Now, if you spent an hour browsing then buying something and another hour moving it from here to there in your home, listing it to sell and posting it, you’ve spent two hours on it. That is two hours lost. If the item cost $50 and you earn $25 per hour, that is another 2 hours lost because it is two hours you worked to pay for an item you don’t want, need or use. Also, if it cost you two hours of time to acquire and dispose of the item and you earn $25 per hour, realistically, the item cost you $100 because those two hours spent on that item could have been spent working. What could you have done with four hours? How often are you making these purchases that cost you time and money that would be better spent doing something to improve your financial future? Next time you go to buy something, work out how much it is really going to cost you in time and money. Do you still want it? Instead of buying something on the spot, have a cooling off period, just like you do when buying a house. Give yourself one week or one month before buying it then at the end of that time if you still want the item, work out how it fits in your budget. The bulk of impulse buys are forgotten about or not used. Instead of buying everything you want, give yourself time and space to truly determine what you want to spend your money on. Cancel store emails, unsubscribe from everything you can, unfollow your favourite brands on social media and put a ni junk mail sign on your letterbox. If you don’t know the sale is on, you won’t feel like you are missing out and are less likely to spend. Instead of making time with friends at the shops go to the park, meet at each others homes or plan another activity that doesn’t cost money. Shopping doesn’t need to be the way we spend time with each other. Create a menu plan so you only need to do grocery shopping once instead of multiple trips to the supermarket. Plan your clothing purchases and choose not to go to the shops unless it is essential. 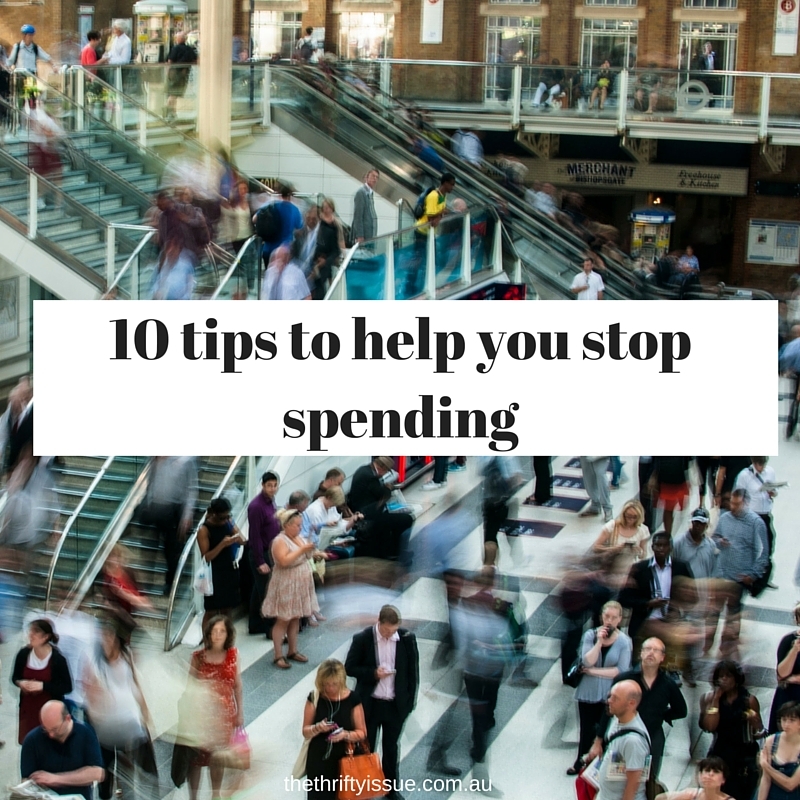 What tips would you add to stop you spending? I’ve suffered from being a shopaholic before. I would used up all my money on things that I would regret buying later. Glad that I was able to stop it like what you did. Your list is very helpful for people who are now experiencing the same. It is an easy trap to fall into! Glad you were able to stop it too. It’s not a nice thought is it? Thinking about how much money we have wasted over time. This is a really great post. I can relate well with you. I also go shopping when I am feeling depressed and then later regret spending all that money on stuff I did not need. I am looking forward to trying out this advice. Thank you. Not spending can be difficult! A tip that helps me is if I use cash vs. a credit card. Using cash makes me realize how much I’m actually spending as I’m counting out the bills. This post has great detail and information. Thanks for linking to Talk It Up Thursday! Great tips! I started using an online budget tracker that really made me see how much I was spending! It definitely adds up!! I’ve never purchased anything I didn’t really need. Even when my dh made a lot of money, I was pretty frugal.